We scoured the series of tubes and found the very best that NYC has to offer. Planning a trip to the Big Apple can be overwhelming, especially if you don’t know where to stay. With so many hotels to choose from it’s hard to tell which ones are a cut above the rest. So, we decided to do the work for you. We’ve hand selected 8 hotels that will impress even the most discerning individuals. Take a look and when you get the chance, indulge. The Lowell: Located on Fifth Avenue, this hotel is perfect for shopaholics. Barneys, Bergdorf Goodman and Bloomingdales are only steps away. And with only 49 suites and 23 deluxe rooms, this hotel is exclusive. But this allows them to treat every guest with personalized service. Casablanca Hotel: A #1 TripAdvisor choice for NYC hotels. Guests can take in the hectic streets of Time Square, and then come back to a relaxing lounge area equipped with a fire-place and self-serve cappuccino machine. The intimate space and romantic ambiance pays homage to the movie it’s named after. The Mark: Recently remodeled with modern French decor. With your first step into the lobby you will notice its black and white striped floor and simple accent pieces. Try drinking a martini in a bar covered with twinkled lights. And enjoy the fantastic dark red and black carpet and cow skinned printed furniture. The James: A favorite among the creative crowd because of new wave architecture, contemporary art and some green friendly touches thrown in. The hotel lobby offers free Apple computers rentals and complimentary happy-hour wine with snacks. After grabbing your complimentary drink, you can head up to the rooftop bar, JIMMY, and enjoy panoramic views of the city. The Greenwich Hotel: If you want a little seclusion while still being close to the action then this hotel is the place for you. 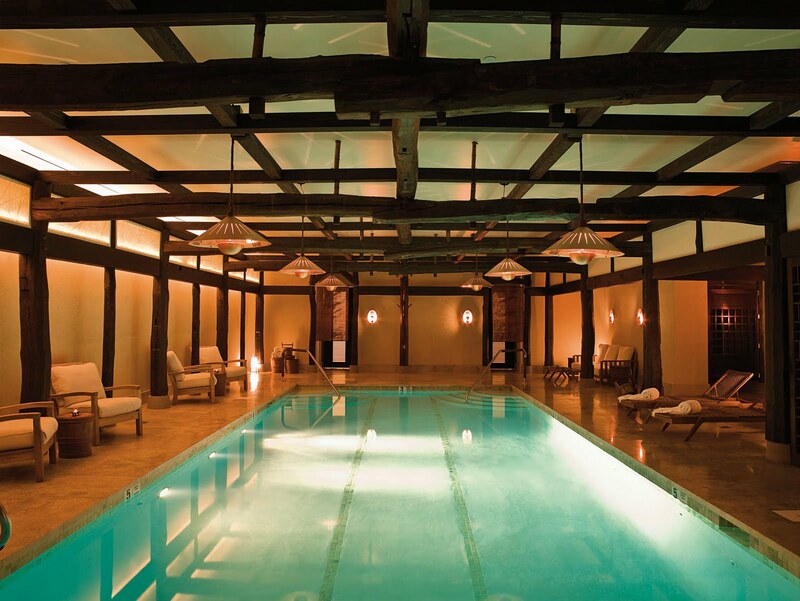 The indoor heated pool is surrounded by low lit lanterns and serves as a waiting area for the Japanese inspired Shibui Spa. The worldly design features Moroccan tiled bathrooms, Turkish Travertine in the courtyard, Tibetan silk rugs and Japanese farmhouse. The Sherry Netherland: Located next to Central Park, you will admire the park view from your room. Feel like taking a stroll, step outside and wander through the park to see what all the New Yorker’s rave about. 414 Hotel: An inexpensive choice as far as NYC goes. This hotel offers an original boutique experience in the four-story brick building. It is composed of two historical townhouses separated by an inviting garden and seating area with an old school cascading fire escape out front. This quaint 22 room hotel will not impress anyone with size, but it might with its value and charm. Crosby Street Hotel: This LEED certified hotel in trendy SoHo is designed in a way that is contemporary with chic patterned furniture yet cozy with a charming garden and drawing-room. The 11-story brownstone has its own unique spin on classic English design with a modern twist by integrating antiques and bold patterns. Hotels can make or break your trip. Make sure you get the best of the best in every aspect by finding the right fit for you. And don’t forget to sign up for Hotel Engine.com to get the best rates and the best rewards.